I volunteer with an education program at a prison. Clear sight lines from the guard towers being essential in a prison, there isn’t much cover, so there aren’t many birds. I’ve seen House Sparrows and Mallards and pigeons. The inmates report that seagulls are prone to getting caught in the barbed wire that tops the fences. The inmates don’t have much sympathy for the seagulls, since they’ve had to try to protect Mallard ducklings from marauding seagulls in the past, generally unsuccessfully. Recently I saw a Red-winged Blackbird and a Common Starling both trying to claim the same bit of fence as their own. I can’t imagine why they wanted the fence (perhaps so that they could listen in on our class and learn how to solve “3 is 60% of what?”, too? ), but it was exciting to see them. Serious birders have state bird lists; I don’t have that, but I do have a mental prison bird list, and both of those species were firsts. 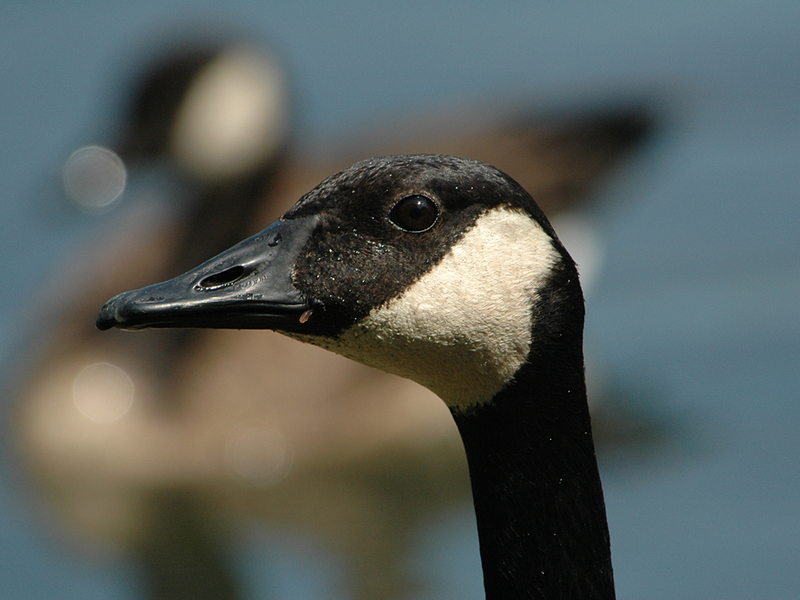 The birds you can really count on in prison are the Canada Geese. There are almost always at least three of them in the yard, and often a dozen or more. Most of the time they seem to be on a different planet from the inmates, the two species passing by each other without a flicker of interaction; but not all of the inmates ignore them. 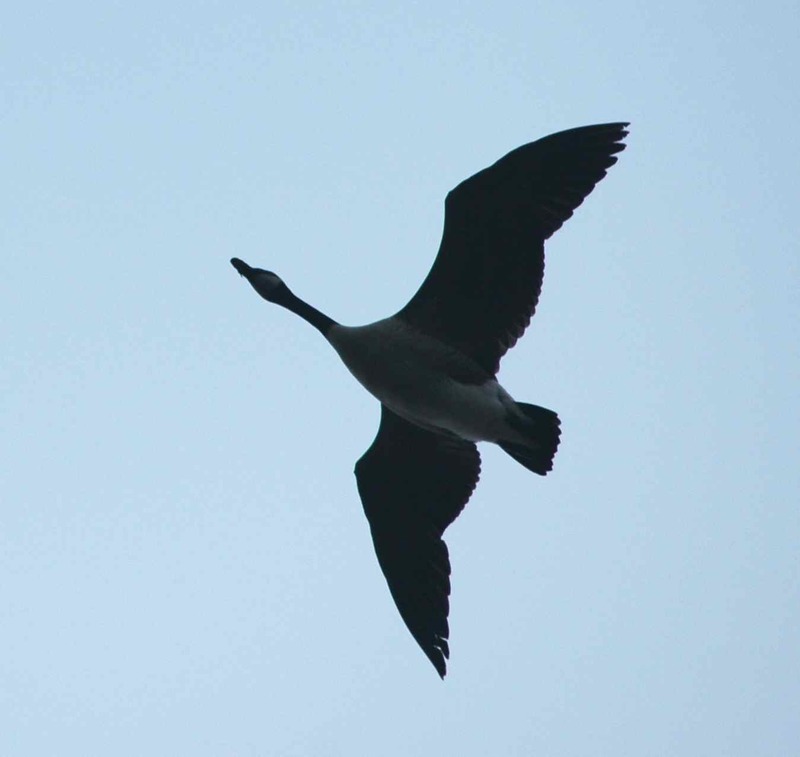 When I started volunteering at the prison, the first question I was asked (once my claim to ornithological knowledge became known) was: “What is Max?” Max is an oddball goose, Canada Goose-like in appearance but splashed with white and bearing a too-stocky neck—some sort of hybrid, I said. The next question: “How do you tell the difference between male and female geese?” You can’t, I said, to general disappointment. Canada Geese are common and noisy and not particularly beautiful, but in the prison yard they might as well be flamingos: alien inhuman creatures, small self-possessed dinosaurs unconcerned by fences or count or lockdown. A bird doesn’t have to be a Painted Bunting to be a respite from humanity. One of the things we don’t like about Canada Geese, I think, is their preference for ugly places, their penchant for turning up in great numbers on swathes of patchy scraggled grass. But there’s something lovely about the goose who settles down serenely in the middle of the prison yard. You don’t need binoculars or field guides for birds to matter to you; you just need birds. Sometimes those birds are Canada Geese. Hurray for the Canada Goose for being there. This entry was posted in miscellaneous and tagged birding, birds, Canada Goose, prison by toughlittlebirds. Bookmark the permalink. Do they come to eat grass growing in the prison yard? Or do the inmates freed them? Occasionally I’ve seen inmates feeding them, but I don’t think that’s enough for it to be the main goose attraction. They definitely eat the grass. They also just seem to be standing around doing nothing a lot of the time, but that might be an artifact of my only seeing them around dusk – maybe they do more during the day. Nice post. Perspective really changes your opinion.